New York, July 10 (KMS): Upset by the rising support for Kashmiris’ right to self-determination at international forums including the United Nations, India has accused the UN Human Rights Commissioner, Zeid Ra’ad Al-Hussein of exhibiting, what it claimed “clear bias” in his report on Kashmir and criticized the UN Secretary General Antonio Guterres of overstepping his mandate, media reports said. In the double-barrel attack, India’s Deputy Permanent Representative Tanmaya Lal told the Security Council on Monday that Zeid’s report was “reflecting the clear bias”. Tanmaya Lal even did not spare the UN Secretary General, Antonio Guterres, and said, “We are disappointed that the report of the Secretary General includes situations, which do not meet the definition of an armed conflict or of a threat to the maintenance of international peace and security.” The report among other also deals with Jammu and Kashmir. During the debate, Lal mentioned Guterres by his title, but did not mention Zeid by name or title while it was clear it was about him after Pakistan’s Permanent Representative Maleeha Lodhi quoted Zeid saying in his report that “there were multiple cases of children under 18 years being arbitrarily detained and tortured”. She also mentioned the blinding of children by pellet guns used by the Indian forces in occupied Kashmir. 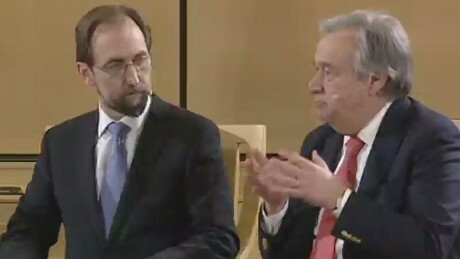 Zeid, as High Commissioner, had called in his report for an international investigation by the Human Rights Council into the situation in Kashmir. In his criticism of Guterres’ report, Lal said he had gone beyond “the clear mandate”. Guterres’ report released last month includes criticism of the Indian government.